After trialling several web based CA's Dog Tag was one of the few CA's I found a reasonable amount of documentation for and has readily available packages for CentOS / Fedora. Use a secure LDAPS connection (Yes/No/Quit) [N]? Storing deployment configuration into /etc/sysconfig/pki/tomcat/pki-tomcat/ca/deployment.cfg. Notice: Trust flag u is set automatically if the private key is present. Created symlink /etc/systemd/system/multi-user.target.wants/pki-tomcatd.target → /usr/lib/systemd/system/pki-tomcatd.target. Click on the request, check the details etc. and finally hit 'Approve' at the bottom. 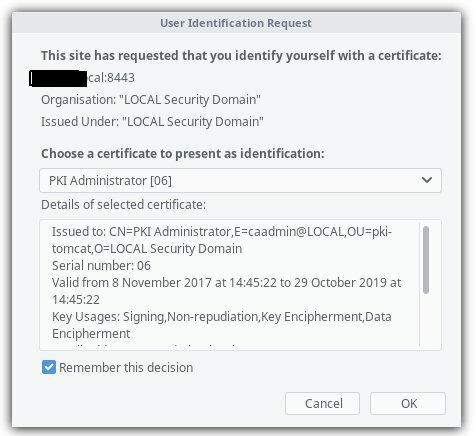 Once it has been approved you should see a copy of the (BASE64 encoded) certificate at the bottom of the confirmation page. Proceed by importing the PFX file into the Windows Computer certificate store under 'Personal'.